A.J. 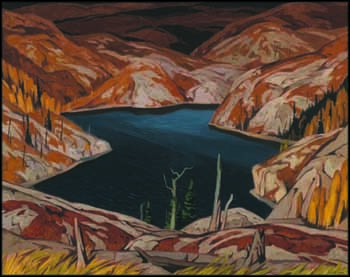 Casson became a part of the Group of Seven in 1926, six years after their first formal exhibition in 1920. Casson had met Group members at Toronto’s Arts and Letters Club, and had been an invited contributor to their shows. He was close to Franklin Carmichael, who he worked with at commercial art firms Rous & Mann Ltd. and Sampson Matthews Limited, and with whom he went on many sketching trips in the Ontario countryside. During the early 1920s, Casson's accomplishments as an artist were on the rise, and Group members were taking note of him. Casson was elected to the Ontario Society of Artists in 1923, and two of his canvases were acquired by the National Gallery of Canada - Clearing in 1923 and Summer Landscape in 1925. After Frank Johnston left the Group, they decided Casson should be one of them. He was never formally invited - Carmichael just informed him he had been made a member on a walk home with their wives from a party at Lawren Harris's house. This pivotal moment would affect Casson for the rest of his life. He shared their passion for the Canadian landscape but was careful to define his own identity artistically within the Group. Ontario was Casson's territory - from the southern towns and countryside to the more northerly untamed land. Lake in the Hills, with its expansive panorama across sculpted hills passing into shadowed, distant layers of land, has the kind of sublime drama the Group of Seven was renowned for. Wild and lonely land such as this forged their nationalist fervour to get out into the landscape and portray it from a completely fresh point of view. Lakes often appeared in Casson's work, so it was fitting that a lake was named after him in Ontario. This is a particularly striking lake scene. From Casson's lofty position at the top of a cliff, the view plunges down into the blue lake at the centre, which passes from deep cobalt into a shimmering lighter blue as it is struck by light at its far end. In the centre of the work, light also makes the pale rock formations glow against the darkness of the terrain beyond. Warm gold and orange in the hills contrasts with the intense blue of the lake, and the palpable crispness of the fall atmosphere further adds to the beauty of the scene. Casson's mastery of his subject is clear, as every element contributes to the striking effect of the scene and the sensation of soaring freedom that it creates.